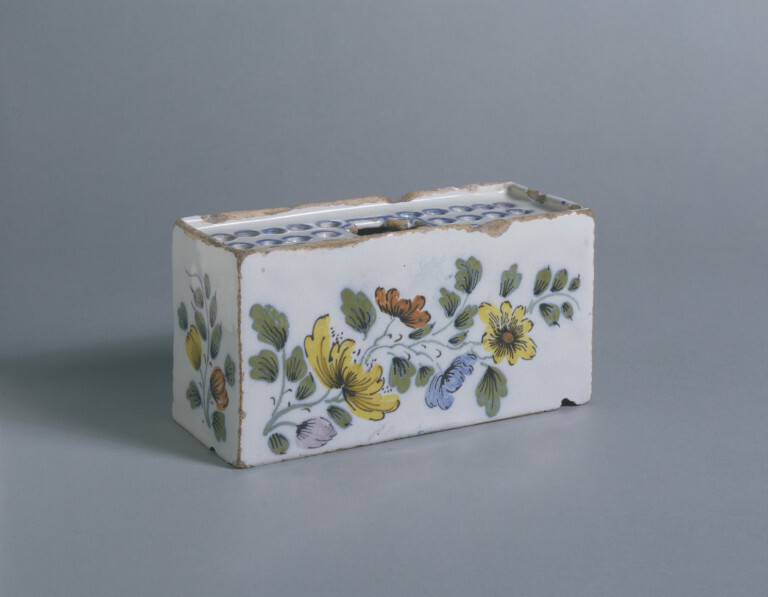 Other than vases, so-called 'flower bricks' seem to have been the most common receptacle for flowers in the 18th century. There is no record of what they were called at the time. There has long been speculation that these objects might have been used as inkstands, with a removable bottle of ink, and space for quills. However, this is unlikely as often they lack a large enough central hole, and also would hold unnecessarily large numbers of quills - particularly as many pairs of bricks are known. Evidence for their use as holders for cut flowers can be found on a painted chimney-board in the V&A (museum no. W.35-1928) which shows similarly pierced containers being used in this way. 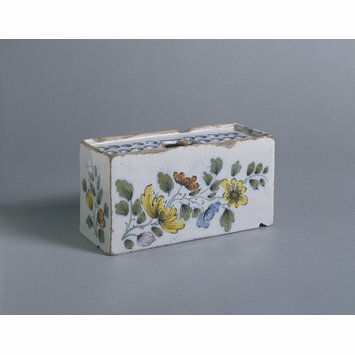 The distinctive range of colours in which this flower brick is painted has come to be known as 'Fazackerly', in reference to a similarly painted jug which was known to have been presented to one Thomas Fazackerly and inscribed 'T.F. 1757'. Delftware objects (tin-glazed earthenware) decorated in these colours, comprising lemon yellow, orange, sage green, dark indigo blue, pale manganese purple and a strong red, can generally be attributed to Liverpool, although the same palette seems occasionally to have been employed at potteries in Bristol. Flower sprays on all four sides in yellow, red, green, blue and manganese-purple. Glaze: Greyish white pooling towards the upper edge.